Side projects aren’t supposed to invite other band comparisons, they’re supposed to separate, to show artisticrange. Who are we kidding here? 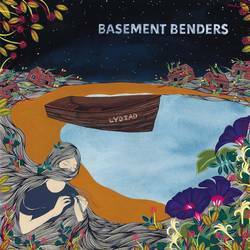 Basement Benders is a punk project out of members of This Bike Is A Pipe Bomb, Hidden Spots, Future Virgins, and Black Rainbow—DIY bands who live the scene, meaning that being themselves and having fun with friends probably outweighs any larger statement. They call this band a product of the sum, and it’s not that far off. Melody through a minimally-produced recording session with first person emotion and singalong choruses drives Lydiad from start (“Purple Days”) to finish (“Trick of the Light”). One of the striking takeaways is the combination of voices, literally and in songwriting, as the 12 song album balances TBIAPB’s more cynical element with the big positivity that rings through Future Virgins’ choruses. For every song like “Modern Medicine” or “Lydia,” which are heavy on the content side, the mood gets lightened by that upbeat zest of songs like “Owen Hart” and “Up North.” It’s not to say Future Virgins songs are all super happy stuff or that TBIAPB as depressing-types, but the styles offer a nice counterbalance that keeps the record chugging along instead of getting bogged down in weighty lyricism. Their styles complement one another. There’s a lot to like here and (surprisingly for a side project) none of the songs are skippers either. First song “Purple Days” starts with a bit of a Ramones vibe to it before those Future Virgins-style melodies take over, and that tone carries into the whole thing with Terry Johnson of TBIPB’s songs bleeding in now and again with the more direct emotion. The song “Lydia” is the clear point of reference for the album title, telling of lost friends and battles with illness, repeated in “Modern Medicine,” a song with some flaws but one that’s indicative of the band as a whole. It features a brilliant melody that’s poppy but gritty and even just a little bit country—with a distorted guitar twang ringing throughout. It’s like a bigger TBIPB song, taking their minimalism and expanding that, and it works great. I find the lyrics a little unclear: is there a specific problem or is it the blanket statement that it feels like to me? But this isn’t the time to wax philosophical, it’s a record review and Lydiad is really good. The content of the two songs mentioned here showcase the emotional element that helps it rise above another political record; I don’t know Lydia but I kinda miss her too after listening. It’s about loved ones and lessons learned; it’s about sharing a lost life with others and keeping memory alive. It’s all that, plus it’s singalong punk rock energy with a basement aesthetic. It’s good stuff. Posted Nov. 30, 2015, 10 p.m.